Only a few things can have a bigger effect on an office space than the flooring that is chosen. The product selected not only reflects the brand and company culture, it also tells employees and visitors about the type of business a company conducts. 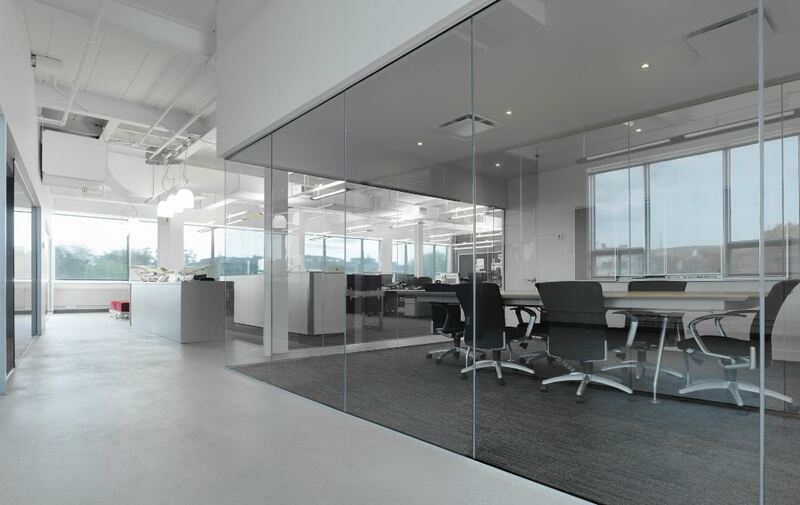 Clients in the commercial office environment are generally sensitive to price, so not only does the product have to be cost-effective, it also has to last a long time and be easy to maintain. Ceramic tiles have been a popular option for many years. Other flooring products that are continuing to gain market share include resin or concrete flooring, carpet tiles and vinyl flooring. Vinyl flooring is available in a variety of patterns, shades, hues and finishes, and its durability makes it ideal for offices. The ease of maintenance and comfort, combined with acoustic benefits and sustainability benefits makes it a viable solution for any office. Cork flooring is making a come-back with its superior acoustic and thermal properties. The product is available with different looks from wood to stone and vinyl-type designs which are created by layers of extremely thin sheets of veneer over a core layer of pressed cork, providing stability, warmth and comfort under your feet. This core cork layer, due to its slight resilient qualities, has the ability to bounce back from hard impacts, making it very robust and increases the life span of the flooring. With a wear protection finishing layer the product is also scratch and abrasion resistant. Carpets have been a long-standing favourite for offices. While a carpet can become stained, the new generation of carpet tiles gives clients the flexibility they need to replace individual tiles without the upheaval associated with flooring maintenance and replacement. Added benefits of carpets in offices include their acoustic properties as well as the advances in carpet manufacturing methods which are seeing more recycled content being used to meet strict green building regulations. Additionally, carpets offer great underfoot comfort and can improve the overall air quality of an office considerably. Polished and stained concrete finishes are undoubtedly a big trend at the moment. 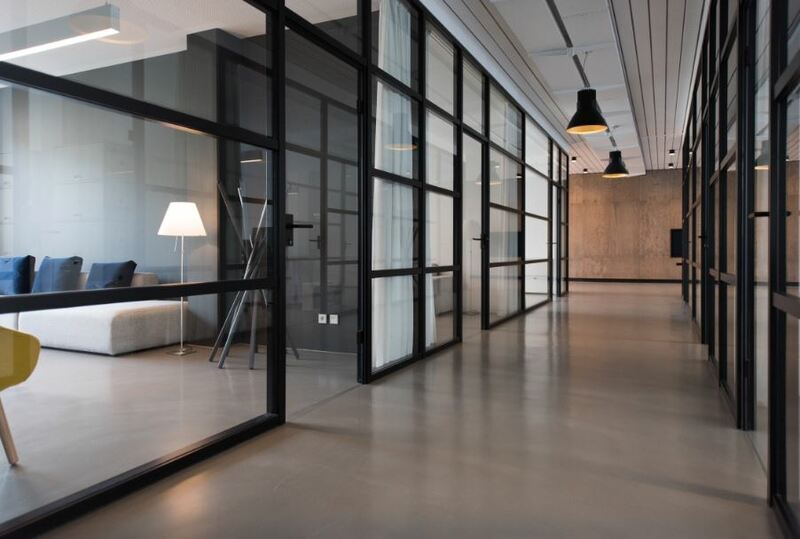 In addition to the on-trend appearance of concrete floors, they are smooth, high-strength and hard-wearing floor surfaces which are easy to maintain and require little maintenance. A self-levelling decorative screed gives a seamless look with less noise particularly in environments where equipment or furniture on castor wheels are in use.Concrete floors with an epoxy coating can give companies a contemporary look and feel, while ensuring they have a hard-wearing floor that will serve them for many years into the future. However, it is important to note that some cementitious floors and epoxy floor coatings are not suitable for use in direct sunlight, or outside as the colours tend to yellow. For these areas, a customised cementitious overlayment with coloured aggregates, which are ground and polished to a smooth terrazzo-effect is advised. This seamless decorative floor is abrasion resistant, low maintenance, easy to clean and extremely durable. It also has a compressive strength that is well suited for high traffic and heavy load environments. Tiles remain a popular choice, as they are ideal for high traffic areas and are easy to maintain and clean. Modern wood-look tiles give the warmth of wood without the associated maintenance and are water resistant. Broken or cracked tiles can easily be removed and replaced extending the longevity of the floor. It is also possible to tile over existing concrete and tiled floors, for a faster and more cost-effective renovation project. For clients who want a more affordable alternative to wood, tile or stone, laminate flooring products offer an ideal solution. Not only do some of these flooring products have scratch and dent resistant protective coatings, they are also easy to clean and maintain. There is a wide variety of laminate options to choose from, ranging from products that perfectly imitate the grains of marble and wood to smooth laminate, embossed laminate and patina laminate. René Swart, Head of Operations at St Stithians College since 2007, and a member of the South African Facilities Management Association since 2013 and board member since 2017, says that one of the pain points facilities managers experience when it comes to maintaining floors is that there are many different types of flooring within an office environment. “With many different floor types, a number of cleaning methods, equipment, chemicals and so forth are required. Another aspect that designers need to focus on is the impact of high traffic areas on the running of a facility. High traffic areas are not always taken into consideration, resulting in those areas requiring more regular cleaning and replacement. However, should a more hard-wearing floor surface be specified in these areas, it would save costs, time and frustration because worn or failing sections would occur less often,” says René. 1. Speak to the office’s facility manager during the concept phase to obtain their input. 2. Consider the type of office environment that the flooring is being laid in because acoustics play a big part in different office spaces. Putting a tiled floor into a call centre, for example, may make the area too noisy. 3. Consider the edges of the floor. Can flooring on the edges between wall and floor be installed in a way that makes cleaning easier? 4. Where there are tiles, are they up against a wooden skirting? If the wooden skirting often gets wet, it will start to look tatty or start swelling and need replacing more regularly. Rather install a tiled skirting with the same tiles as the flooring for a seamless look. 5. When specifying tiles, consider full body porcelain tiles. They are more durable and if chipped, they don’t show as much of an aesthetic difference as a chipped ceramic tile, where there is just colour on the surface. 6. Tile flooring finishes are important. A slip-resistant finish is better suited to high-traffic areas or where there may be water on the floor such as in the bathrooms. There are also other less common pointers that designers can keep in mind when designing interiors for an office environment. “Furnishings can be changed more easily than floors so if colour is needed, this can be part of the décor. Consider using loose rugs for extra colour. Ensure that what is being specified is going to be around for a while should small areas need replacing. Also keep the cleaning methods, equipment and chemicals in mind when choosing a floor for an office,” says René. Other practical considerations include considering the cost, timing and stock availability of flooring, as facilities managers need to ensure they are causing the least inconvenience to the users of the space when flooring replacements need to be made. “It’s also important for designers to consider more than staff preference when selecting flooring as staff may leave. Rather focus on what is practical for the building environment as a whole,” concludes René. Expert tip: One of the pain points facilities managers experience when it comes to maintaining floors is that there are many different types of flooring within an office environment and the suitability (cleaning methods, durability, etc) of each type is not taken into consideration when deciding which to use. Full thanks and acknowledgement are given to www.abe.co.za, http://za.chryso.com, www.floorworx.co.za, www.polyflor.co.za, www.safma.co.za, www.stithian.com, www.tal.co.za, www.tileafrica.co.za/Commercial, www.traviata.co.za and www.vandyckfloors.co.za for the information in this article.